Do initiatives like the Google Art Project help us see more – or less? These days, websites have trailers. The ‘teaser’ video on YouTube for the Google Art Project opens, sedately enough, with a painting hanging on a wall. 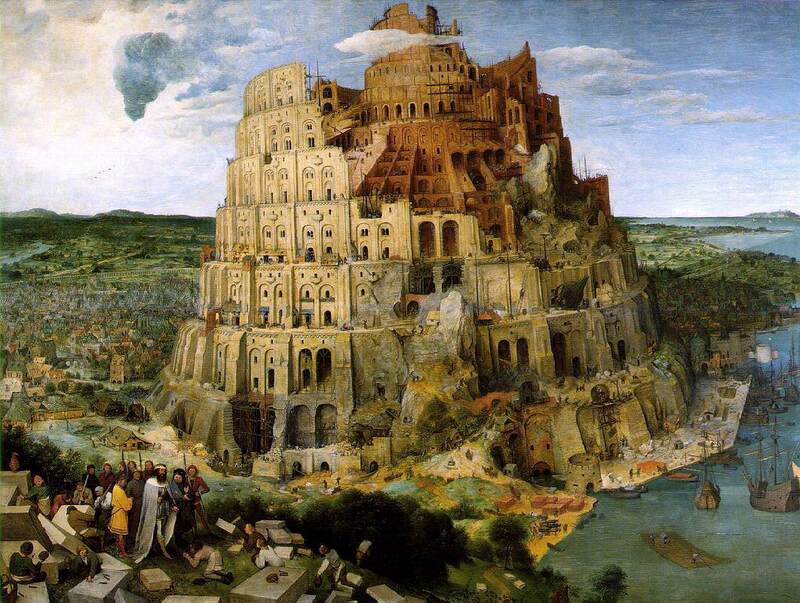 From middle distance, Pieter Breughel the Elder’s The Tower of Babel (1563) looks as if the colossal edifice is collapsing rather than growing. But then the camera zooms in, drawing closer and closer to the painting, eventually coming so close that it bursts through a tiny dark window in the tower. Whammo! We’re soaring through the galleries of Vienna’s Kunsthistorisches Museum, where Breughel’s painting hangs. Then we’re in Tate Modern’s Turbine Hall, then the Palace of Versailles. We sail on through countless other museums. Then we’re again swooping at paintings, now homing in on the very eyeball of the central figure in Bernat Martorell’s Altarpiece of Saint Vincent (1438–40) – which, at microscopic range, disintegrates into soft daubs and cracked tempera. The camera telescopes through an enfilade of masterpieces, never stopping, always going forward. In in in in in. Anyone who has seen Charles and Ray Eames’ film Powers of Ten (1977), in which the picture zooms from the cosmic to the atomic, knows that magnification rarely clarifies – it only reveals further layers of detail. The Google Art Project is just one of the many recent initiatives to make the contents of the world’s museums accessible to anyone with an Internet connection. Just what that term accessible means, however, is open to interpretation. Is accessibility about the semblance of physical proximity? Is it about ownership? Or is it about understanding? Issues of image resolution have, thus far, dominated conversations about the presentation of art online. In 2007, an Italian company showed off its technological capabilities by posting online a 16 billion pixel image of Leonardo Da Vinci’s The Last Supper (1498); the company, Haltadefinizione, and its sister enterprise Notpainted, offer high quality digital reproductions of paintings to the advertising and publishing industries and – in the case of Notpainted – to clients willing to pay big bucks for hi-def copies of masterpieces to hang in their homes. The Google Art Project, which was launched in 2011, boasts high image resolution throughout. In addition, each participating museum is permitted to select from its virtual gallery one art work for ‘gigapixel’ reproduction, enabling users to examine part of a billion-pixel image at a near-forensic degree of magnification. The value of such a facility is uncertain, except as a means for Google to show off its powerful servers. The company’s developers, it seems, have flatly misunderstood the practice of close looking, at least when it comes to art. The idea that by literally getting closer to a painting – the kind of intimacy typically withheld by art museums for obvious reasons of safety and conservation – will lead to greater understanding is barmy. Where is the truth of Breughel’s painting? Up close – inside that window – is only darkness. But from far away, the half-built structure appears to cave in on itself. The tower’s fate, Breughel tells us, is written on the walls. Stand too close and you won’t be able to read the message. Thankfully, proximity is not the only thing that web technology offers art viewers. Other initiatives place their emphases elsewhere. Some museums, like the Rijksmuseum in Amsterdam, permit out-of-copyright works from their collections to be reproduced rights-free, making high quality Jpegs downloadable for that purpose. Many websites – including that of the Rijksmuseum and the Google Art Project – encourage users to assemble virtual collections of their favourite art works (that possessive impulse again!). Website users are commonly seen as active contributors, with museums begging for comments and feedback on everything from the art in their collections to people’s experiences of visiting exhibitions. A British visitor to Los Angeles County Museum of Art’s website recently contacted the museum to observe that a painting in its collection used to hang in his school dining room; many museums rightly aspire to engage an audience more broadly dispersed than that in their geographic locale. It is also a fact that the collections of most museums far exceed the space available for their display; an online archive is an effective means for the public to browse the virtual racks of a museum’s storage. New York’s Metropolitan Museum of Art and LACMA have even made many out-of-print catalogues available for free online. None of these functions, it should be noted, are intended to usurp the experience of a visit to see art in situ. Nevertheless, certain museums attempt to compensate for the scalelessness of zoomable and interchangeable Jpegs by representing them installed in interactive facsimiles of their galleries; the virtual walkthrough has become as much of a presentational cliché (and just as unsatisfactory) as the formats of the vertical flat file or slideshow. The Google Art Project adapted its famous 360-degree Street View cameras to capture the interiors of certain participating institutions; the uncanny experience of moving through such a virtual space only draws attention, however, to what is persistently lacking. The atmospherics that enrich the presentation of an art work include (but are not limited to) sounds and smells, the mobile effects of changing light and the behaviour of other people in the space – all of which is evacuated from a disembodied gallery fly-through. When we frame online access to art only in terms of penetration or possession, we ignore the manner in which museums and their art works – especially paintings – hold their viewers at a deliberate remove. Ever since Leonardo developed his technique of sfumato, in which ‘light and shade should blend without lines or borders, in the manner of smoke’, as he wrote in his notebooks, the medium of painting has drawn much of its power from indeterminacy and evasiveness. ‘How long it takes to find out what people are doing in pictures, even in simple empirical terms!’ exclaims TJ Clark, three-quarters’ through his book The Sight of Death (2006) and more than a year after he started looking – probably more closely than anyone has before or since – at two paintings by Nicolas Poussin. Clark’s memoir of his gradual enlightenment is a testament to how slowly paintings give up their secrets, even when, like Clark, you have time to sit and observe them firsthand under different atmospheric conditions over days, weeks and months. The book ends disconsolately, when one painting, Landscape with a Snake (1648), is returned from the light-filled Getty Museum in Los Angeles to a ‘desolate thruway’ in London’s National Gallery. ‘Paintings are defenseless, paintings are survivors,’ writes Clark. Perhaps we need not wring our hands too much over their maltreatment online; doubtless paintings will survive too whatever indignities the information age can throw at them.